We've been championing skull jewellery for what feels like yonks and now they've got a seat in the key jewellery trends of A/W 2010, there's no stopping us. So, yeh, The Skullery pays homage to our trusted friend, the skull! This range will channel your inner goth and add a macabre edge to your outfit (not all jewellery is pretty ya know!). This collection is where the most sparkly of skulls meets the downright ugly, producing the most amazing and enthralling of jewellery collections. So, which pieces out of this ghoulish bazaar are we hopelessly head over heels with? 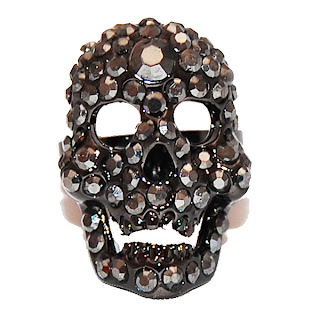 Well to start is this Black Crystal Skull Ring, priced at £10 (we also have a pink and green version). Statement hand candy, only it's anything but sweet. This ring needs to be paired with a bright outfit and should never be seen with top-to-toe black! These Gold & Skull Crossbone Earrings are so dainty they could almost be deemed cute. 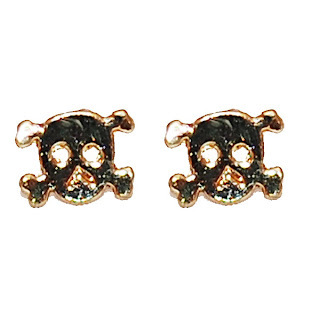 Being so small they add an edge to standard gold stud earrings but are not in-your-face skull. With them being priced at just £5, they're an ideal way to update to the latest trend without breaking the bank! 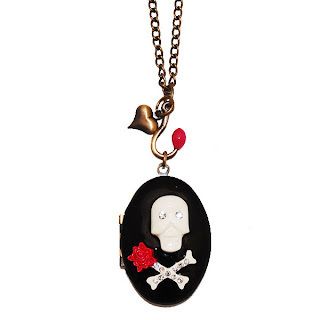 We adore this Black & Red Skull Locket, priced at £14. So unusual, mixing the delicate red rose with the grotesque skull and crossbone. Also, the locket hangs on an antique gold hook, adding yet more detail. We're particularly attracted to this necklace's quirkiness and its re-defining of the traditional locket. L-O-V-E!